Iverhart Max prevents canine heartworm disease. It also treats and controls roundworms, hookworms, and tapeworms. Iverhart Max requires a prescription from your veterinarian. Give Iverhart Max Flavored Chewables once a month on the same day of each month year round. Iverhart Max Flavored Chewables can be given by hand, mixed intact with a small amount of food, or placed in the back of the dog’s mouth for forced swallowing. Watch dog closely following dosing to be sure the entire dose has been swallowed. If it is not completely swallowed, give one more full recommended dose as soon as possible. View Iverhart MAX Chew Drug Facts Sheet. Tip: Do not remove chewable from its wrapper until ready to give to pet. How it works: Iverhart Max is an anthelminthic (dewormer). The ingredient pyrantel pamoate is used to treat and control roundworms and hookworms in dogs. Praziquantel is used for treating and controlling tapeworms. Cautions: Side effects of Iverhart Max are rare, but may include lethargy, limpness, salivation, shaking, diarrhea, decreased appetite, licking lips, and belching. 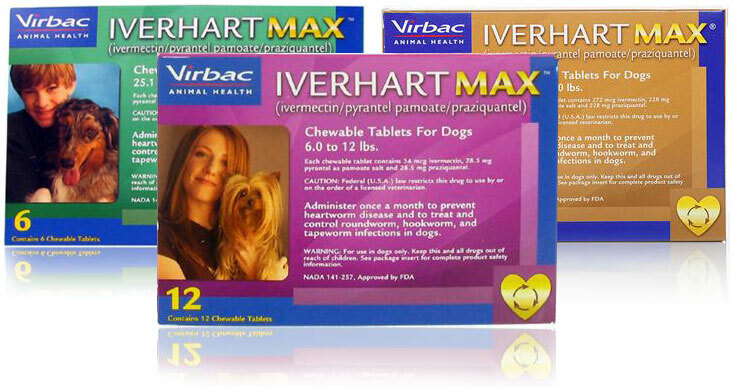 Do not give Iverhart Max to your pet if already giving a different heartworm medication. I am pleased that your pharmacy still had this product available when I ordered; unfortunately now that I need to order again for my other greyhound, it is no longer available, on backorder with no known date regarding when it will be back in stock. Price of this medication was reasonable (had a promotional code for 12% off), my vet was contacted promptly for prescription approval, and free shipping was fast. Product arrived in good condition and as described. Iverhart Max not only prevents heartworm, it also treats and controls Roundworms, Hookworms, and TAPEWORMS! I would definitely order again from this pharmacy if only it was available!!! ProsTreats and controls roundworms, hookworms and tapeworms as well as preventing heartworm disease. ConsNo longer available at this time. I have been using this for years for our dogs, instead of the Heartgard I use to use before. It is significantly less expensive. ProsThe price. Less than half that of Heartgard. ConsEven though these are "chewables", our dogs don't care for the taste and will spit them out. So I have to use the forced swallow method of administering. Also, I just found out that the manufacturer has suspended production - something about changing locations or a new facility - and when current supplies are gone will likely be unavailable until sometime next year.